Why Managing Change Can Fail Without a Clear Vision and Mission? One of the most common analogies for organizational vision is a roadmap. The leader’s vision guides the vehicle—or the company—towards that destination, managing change along the way. Eric Basu, Forbes contributor, offers a different viewpoint: “The vision is the reason for being in the car and driving in the first place.” This statement highlights the importance of establishing vision, which is step one in my model for managing complex change. 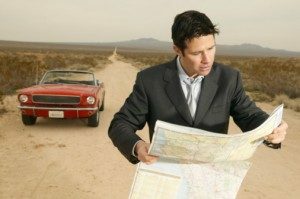 A map has many alternate routes, but the reason for being “on the road”—or in your business—remains constant. Getting at that reason often trips up an organization. For a company to effectively strike a direction (i.e., the roadmap), vision statements demand more than reciting lists of specialties or things that you do in your business. A focus, with clarity about what the business is striving to become or the stature to which it aspires, is required. Moreover, in order to effectively weather change, organizations need a clear, stable, yet flexible vision statement. When hitting business snags, vision statements are a bellwether and a benchmark for not only managing change but also to help reposition your objectives. An organization lacking a vision is like a group of people in a car who don’t know why they’re driving, much less the direction they ought to take. Yogi Berra once described to a friend how to get to his home: “If you come to a fork in the road, take it.” Without vision, your roadmap is just about as helpful as his directions! In business terms, a poorly communicated vision statement (or lack thereof) can lead your employees to interpret expectations differently; clearly not acting as a team, they choose activities or objectives without direction or that fail to perform. For change to be successful, it needs to align with the vision. In my experiences with executive teams, a CEO often has a direction for the company firmly planted in his/her mind, but the troops are unaware or lack clarity around it. Successfully managing change requires discussion and understanding. Any organization going through change needs to be grounded; in other words, everyone needs to know why they’re in the car. Attempting to implement change before writing a vision statement limits your ability to develop viable action plans. Your team embarks on a series of false starts where action is initiated, doesn’t “fit,” and is ultimately abandoned. The driver turns the car around and heads towards another dead end. These actions waste resources and exhaust and demotivate your staff. Imagine a sales team without a strategic corporate vision. They may make sales, but do they make choices that align with the leaders’ goals? They may sell to the wrong clientele or into the wrong market. They may spread themselves—and the company—too thin. These false starts and tangents take their organization further away from strategic goals, costing time and money. Managing change is a skill that is extremely valuable. A coach can help provide invaluable feedback and help to ensure you are effective. Take ownership for your company’s vision statement as well as your personnel’s relationship to it. Positive, sustainable change depends upon five critical keys. As the leader of an organization, neglecting this essential task is done at your peril. Having a strong vision, which is clearly articulated throughout all levels of the organization, is step one.